Vision is critical. We have found the best communities were both relationally and purpose driven. They have almost always started by identifying (usually by networking) a core leadership group of the “right” kind of people on campus. Find the right people at the beginning and you are more than half way there. It remains the case that there must be at least one person who keeps the email lists who can be trusted to write appropriate messages and meeting reminders. It remains the case that there must be at least one person who says, if nobody else takes responsibility for initiating leadership, I will do it. We find it best when there is a team of such people. Successful fellowships (or Christian communities) on campus almost always meet regularly, either monthly or weekly during the academic year. If you don’t have this planned out pretty well from the start as to when, where and the “what” of our meetings you significantly lessen your chances of growing your fellowship. While politics are very important to academics generally, we have found that Christian faculty communities flourish better if they are centered on key theological issues like the person of Jesus Christ and God’s grace in Him. There’s plenty of time and place for discussing other important issues, but as the saying goes, the main thing is that the main thing remains the main thing. Those other things can then can be put in the context of those most important things. In essentials unity, in non-essentials liberty and in all things charity. Our ministry (and we recommend your community) does not endorse any particular parties or individuals in elections. Never underestimate the importance of being faithful with the people God gives you. If you are available and faithful and leave the results to God, He can do more through you and your people than all our best laid plans. Invite “outside" speakers from time to time to spice things up. Have them speak for no more than 25 minutes and have a time for Q & A from the audience. Develop a list of potenital outside speakers who are familiar with academe and are capable of speaking to Christian scholars on topics they would be interested to hear. 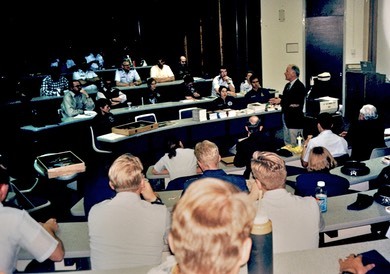 Make sure your first meetings are among your best, that is, with what the group would likely find to be the most interesting topics (discussion) and speakers. Once you establish that kind of track record, you don’t have to have a home run every time. Most people come to meetings because they are personally invited by someone (even though email reminders are useful), and keep coming if they feel comfortable in the group setting you offer. Start your meetings on time and end on time--every meeting. Allow some time in every meeting for people to introduce themselves and get to know who is there. There are many groups including Cru (formerly Campus Crusade for Christ and InterVarsity Christian Fellowship) who work with university faculty. You may find help from some of their faculty ministry leadership. Consult their websites. If asked, we would be glad to consult with you and your leadership team about improving your Christian faculty communities. 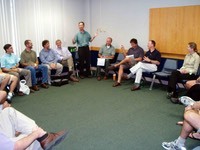 Our ministry staff and associates have consulted with faculty groups like yours for decades. We also have many other proprietary (but with no cost to you) online resources and aids that we can make known and available to you upon request.